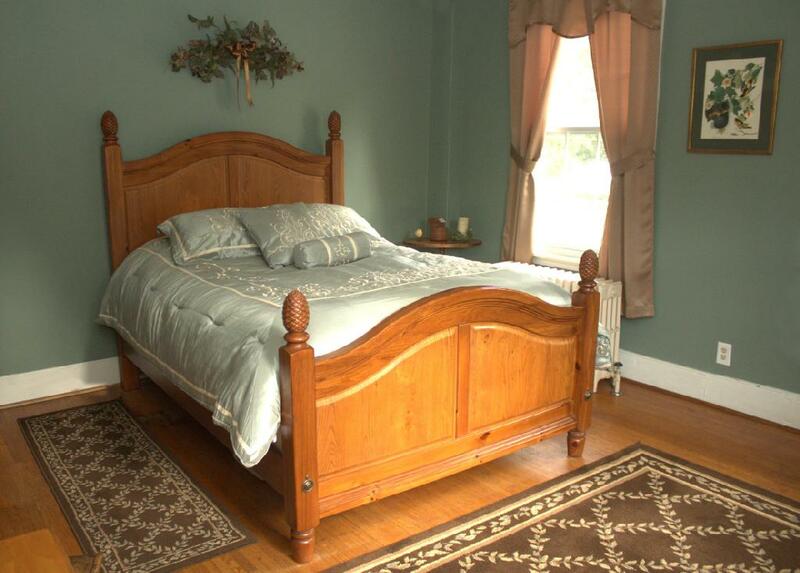 The Bird Brook Bed and Breakfast is located in an historic house in Chittenango, New York. 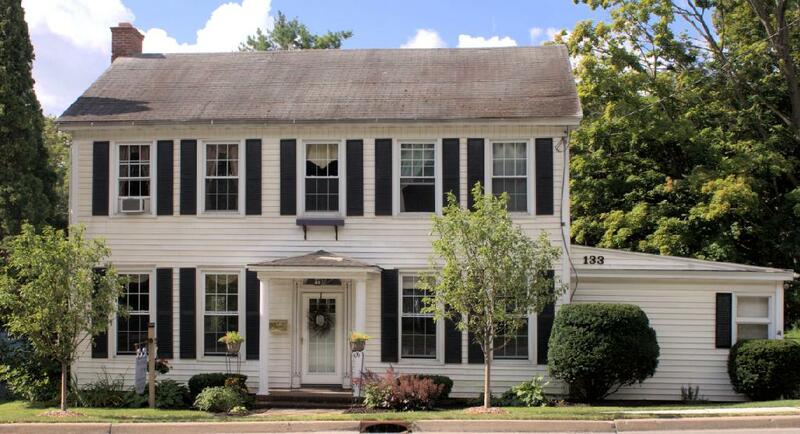 This 1830's home is the family residence of Terry Lee Houseman Shaler and Tom Willson who opened their doors in 2009 to guests who wish to experience the charming elegance of a boutique styled bed and breakfast in an antique historic home. Each guest room is thoughtfully and uniquely decorated and appointed to offer a relaxing and enjoyable experience. Our charming home welcomes guests all year round. 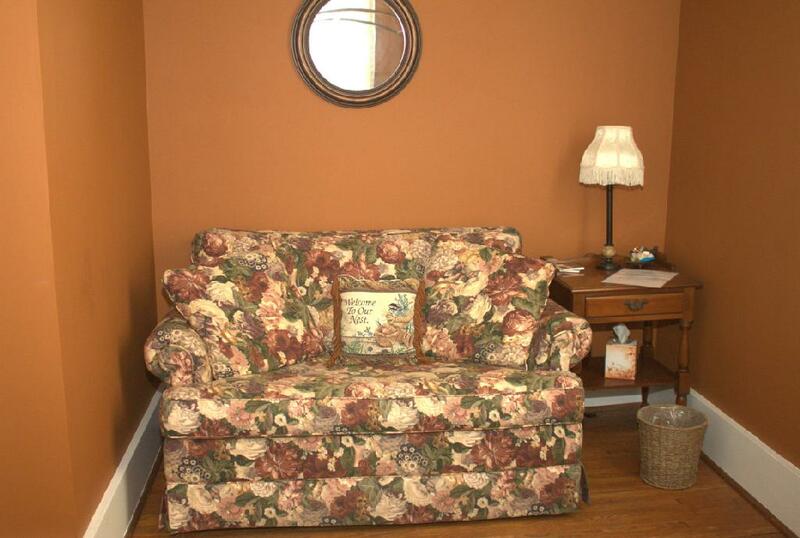 Guests have access to the front room parlor, the dining room, the reading nook, and their own rooms. On a weekend during the colder months the front parlor has a warm and welcoming fire in the stone fireplace and on warmer months the parlor room French doors open onto the back porch where guests can enjoy relaxing and watching the many species of birds including sweet hummingbirds that visit the Bird Brook. For quieter moments our guests can relax upstairs in the reading nook or retire to their rooms. Each room is equipped with Wi-Fi and a writing desk. 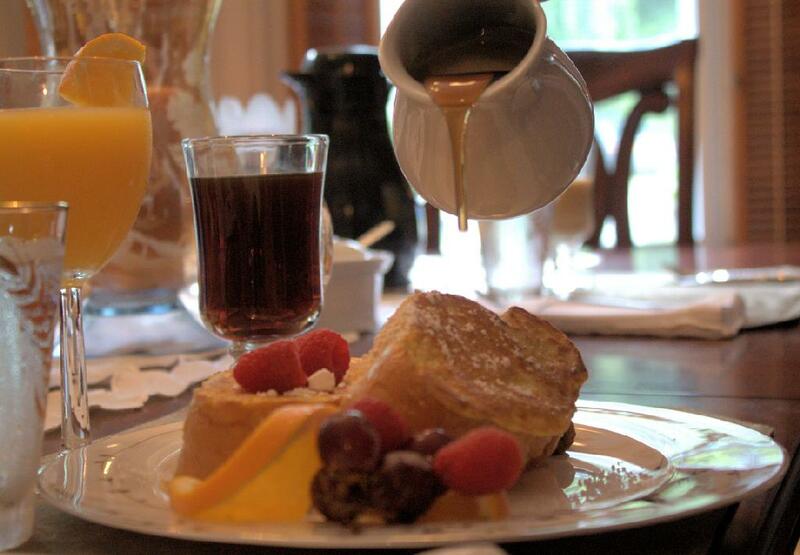 Our formal dining room welcomes guests each morning for breakfast: on weekdays an expanded continental breakfast and on weekends a full brunch style breakfast prepared by your host, Terry Lee an experienced and creative cook. If you are planning to be in the area and would enjoy a memorable overnight experience, Terry Lee and Tom invite you to call and make a reservation. They would love to open their front door and share their antique home. 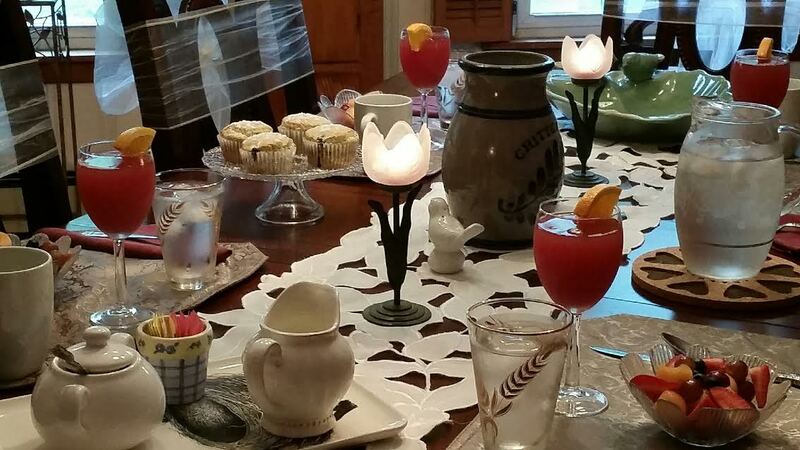 Whatever your occasion, every attention will be given to bringing you the comfort and amenities you seek in a bed and breakfast experience. Please call and accept our invitation to reserve a night or two or three, and be our guests. The Cardinal room extends the privacy of an elegant boutique hotel integrated with the warm family experience of a bed and breakfast. This room enjoys a private entrance and bath and is situated in the house off the formal dining room. Each weekend morning you will be treated to a deliciously created homemade breakfast, prepared and served by your hostess, an experienced chef. Weekdays a extended continental awaits you. The room is elegantly and comfortably decorated in rich burgundy and antique styled furniture with a sleigh queen sized bed. At the little desk you can open your iPad or laptop and catch up on your email or work. Spending a stay as a guest in this genteel private room is a renewing experience. 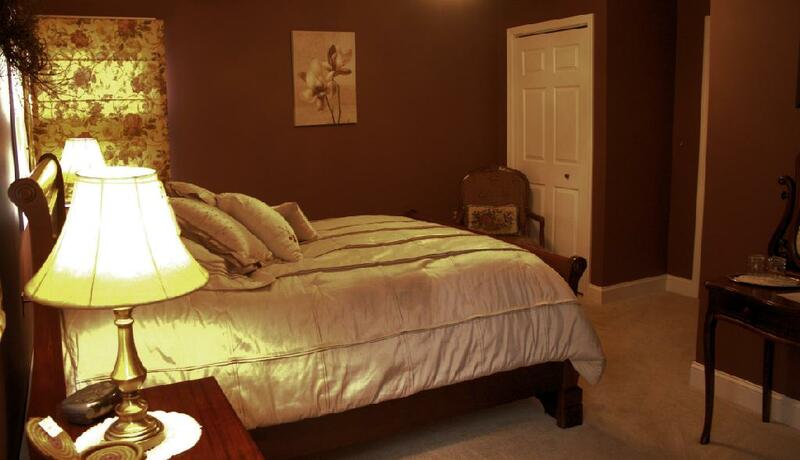 The Sparrow Room welcomes you to a second floor bedroom and a shared bath. Together with your hosts and other guests you will share the bustle of a big antique house, where the hosts live by the golden rule that "our guests" always come first. This large, cozy room is decorated in soothing muted sage tones that would welcome any sparrow to sit and rest for a while. 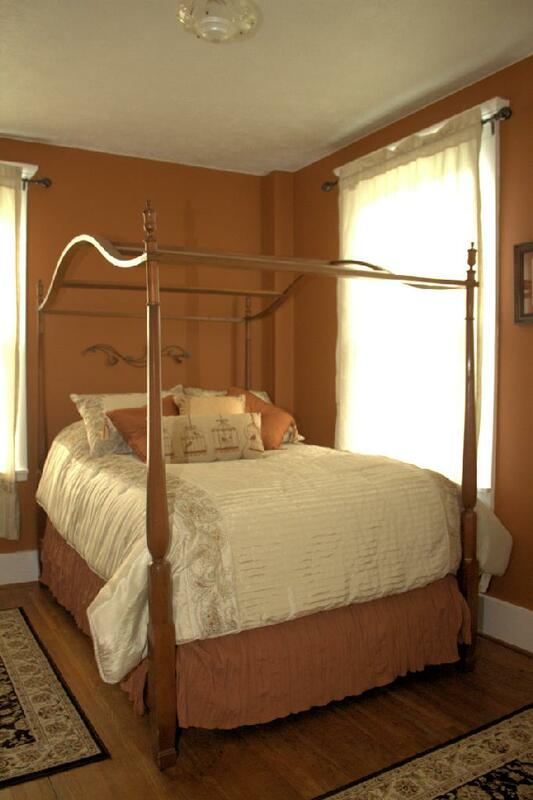 The room is decorated with antique styled furniture and a four poster queen size bed. Each weekend morning you will be treated to a delicious homemade breakfast, weekdays a extended continental, prepared and served by your hostess, an experienced chef. The Finch room is an old fashioned cozy room with a canopy bed and a sweet little sofa that becomes a single bed. Staying in this room is a true B&B experience with a shared bath and the bustle of a big antique house where your hosts live by the golden rule that "our guests" always come first. This room's warm inviting copper tone with antique styled furniture welcomes guests to relax. Each weekend morning you will be treated to a delicious homemade breakfast and weekdays an extended continental prepared and served by your hostess, an experienced chef. Please call to make your reservations. Reservations will be confirmed upon receipt of payment within 5-7 days. All reservations are based on double occupancy with a breakfast included for each day. Additional guests will be charged for their stay. Sorry, we cannot accommodate pets or young children. We maintain a smoke free environment in our house. You are welcome to smoke outdoors. A 50% deposit is required if staying for more than one night. This is due within 5-7 days after booking to hold your reservation. Balance due at check-in. If staying for just one night, full amount is due within 5-7 days after booking to hold the reservation. We accept cash or checks. No credit cards, please. Price of rooms does not include taxes. An 8% sales tax and 4% room tax will be added to your total. Check in is from 5-8 pm. Check out is by 11 am. Cancellation policy: (Does not include prime weekends)Cancellation is required 14 days before the date of your reservation or the full amount is due; unless the entire reservation can be completely rebooked for that time. If the reservation is completely rebooked your deposit (or full amount if staying for just one night) will be returned less a $35.00 cancellation fee. Prime Weekends: Graduation & Parents Weekends. The full amount is due within 5-7 days after booking to hold your reservation. Any change of reservations are non-refundable.